One of his finest, most sensitive portraits, Roberts' 'Portrait of Florence' was one of a number of paintings that were inspired by pretty women and a delight in the decorative fashions of the day. Florence Greaves was a painter and former pupil of Roberts, whose father W.A.B. Greaves owned Newbold Station (north of Grafton, New South Wales) where Roberts painted 'A mountain muster' 1897. 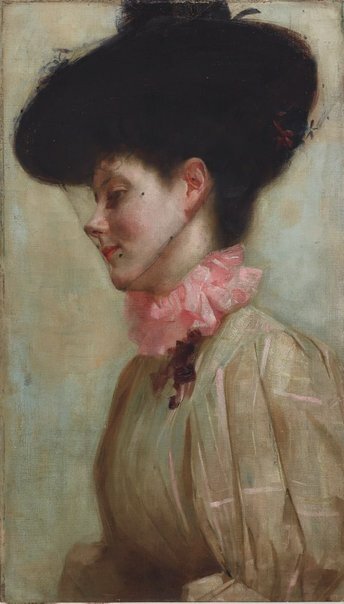 While highlighting Roberts’ ability to position and light his subjects to best advantage – a skill he had acquired during his time as a studio photographer – the delicate palette, particular attention to flesh colour and use of black, reveal influences from Whistler and Velásquez that Roberts had absorbed during his visit to England and the continent in 1882-1884. 19th century Australian watercolours, drawing and pastels from the Gallery's collection , Sydney, 2005, 120 (colour illus.). Bailed up: the story behind the painting , Sydney, 2006, 14-15. Daniel Thomas, Art Gallery of New South Wales Quarterly , 'Tom Roberts', pg. 466-487, Sydney, Jul 1969, 476 (illus. ), 477. Ronald Vickers., The Christian Science Monitor , 'Portrait of a lady', Boston, 22 Apr 1975, (illus.). Article featured in 'The Home Forum' section; page number unknown. Peter Ward, The Australian Magazine , 'More or less than meets the eye', pg. 23-27, Sydney, 28 Sep 1996-29 Sep 1996, 25 (colour illus. ).